Backups ensure that your critical data will survive any of the likely hazards. Too many individuals and companies have suffered from having their hardware lost or stolen, destroyed by fires or natural disasters, infected with malware or corrupted by targeted hacker attacks. Common sense dictates that all hard drives will eventually fail; the question is whether or not you are prepared for the worst-case scenario. For a one-computer user, the backup strategy can be as simple as copying all important files to another device – or, ideally, several devices – and keeping them in a safe place. However, for multiple computer systems, things can be (and usually are) much more complicated, especially when it comes to virtual environments containing thousands of virtual machines. In these cases, a comprehensive data protection plan should include the 3-2-1 backup rule. The 3-2-1 backup rule is an easy-to-remember acronym for a common approach to keeping your data safe in almost any failure scenario. The rule is: keep at least three (3) copies of your data, and store two (2) backup copies on different storage media, with one (1) of them located offsite. To clarify, let’s take a look at each point of this rule. Even a trivial event, such as a fire alarm triggering the sprinkler system could literally wash all your data away. Countless other incidents could bring about the same outcome – for example: theft, fire, a disgruntled employee exacting revenge for imagined slights, or the vandalism of a rioting mob. Therefore, having one backup isn’t enough, especially if it is stored in the same premises as the primary data and on the same type of media. Obviously, the more backup copies you have, the less chance you have to lose all of them at once. Thus, the 3-2-1 backup rule states that you need at least three copies of your data, meaning the primary data and two backups of this data. We must remember that any storage device will fail sooner or later. Hard drives fail over time, whether because of a defect or simply wearing out. Two devices of the same type have a much greater risk of failing around the same time than two devices of different types or two different storage media. Thus, the 3-2-1 backup rule says that if you keep your primary data on an internal hard drive, store your backup copies a different way – for example, using an external hard drive, optical disks, digital tape, or the cloud. A good alternative is using a Network Attached Storage (NAS), which is a smart hard disk box you can attach directly to your network and use to store your important data in a resilient and redundant format. NAS devices act independently from the rest of the infrastructure they are attached to and stay accessible for data retrieval, should your infrastructure go down. More than that, by installing the NAKIVO product on a NAS, you can build your own VM backup appliance. As it is obvious that a local disaster can damage all copies of data stored in one place, the 3-2-1 backup rule says: keep at least one copy of your data in a remote location, such as offsite storage or the cloud. If you want to protect your data from disasters, which might strike large areas, “remote” should mean as far away as possible, i.e., in another city, state, country, or even continent. 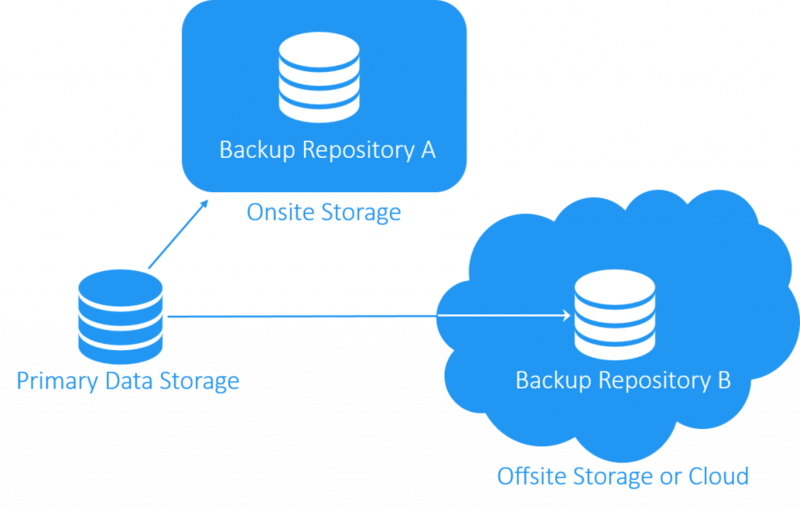 While storing one backup copy offsite strengthens your data security, having another backup copy onsite provides for faster and simpler recovery in case of failure. Is the 3-2-1 backup rule perfect? There is hardly anything perfect in the world, but the 3-2-1 approach is the best practice recommended by information security professionals, as well as government authorities, e.g., US-CERT (United States Computer Emergency Readiness Team) in its Data Backup Options publication issued in 2012. Multiple copies stipulated by the 3-2-1 backup rule protect you from losing your primary data together with its only backup copy, whereas storing copies of data in multiple locations ensures that there is no single point of failure and that your data is safe, should something happen to any of these locations. There are many concepts that factor into good backup design, as well as a great number of pros and cons to consider in every aspect of their implementation. The challenge is not to build a universal solution, but to develop a well-balanced data protection plan that best suits your individual needs. Therefore, while including the 3-2-1 backup rule, the plan should cover many other aspects of data protection, such as critical data areas, backup types, storage media, scheduling, disaster recovery operation, automation, encryption, regular live testing under different scenarios, etc. People often tend to think in terms of the probability, or improbability, of big natural disasters for their location. Of course, tornadoes, earthquakes, and floods could be the most unlikely of events for your city. You may also not believe in the probability of a terroristic attack, but most of the common hazards that can lead to data loss or corruption are always present. Even if your facility is well protected against theft, voltage surges and water or fire damage, there are still many other threats, which are largely outside of your control: device failure, viruses, malicious attacks, volume and directory glitches, transfer corruption, and human error. The 3-2-1 backup rule is a good recommended start in building any data protection system – a way to protect your data from loss/corruption and to control risks in all of the aforementioned situations. Being well prepared in advance is the best data protection policy. Also, when applying the 3-2-1 backup rule, don’t forget to choose the right VM backup solution to create backups of your primary virtual data. Depending on your organization’s needs, you may opt from the available editions of one of the most advanced and sophisticated VM backup solutions – NAKIVO Backup & Replication. Download the full-featured Free Trial of NAKIVO Backup & Replication or request a Live Demonstration of the product below.